Nutrient-rich fruit represents an important part of a healthy diet, but like all foods that give you energy, they contain calories. Consuming too much of any food -- even nutritious, low-fat foods such as fruit -- can lead to weight gain. Eat fruit in moderation and choose lower-calorie options if you need to reduce your caloric intake. To avoid gaining weight, you must maintain a state of caloric balance, eating only as many calories as your body burns through daily functions and exercise. If you eat 500 calories more than your body burns each day, you will gain weight at a rate of about 1 pound per week. Consult a nutritionist to determine how many calories a person of your size and physical activity level needs every day and avoid exceeding this caloric limit. Current dietary guidelines recommend a relatively low daily intake of fruit. 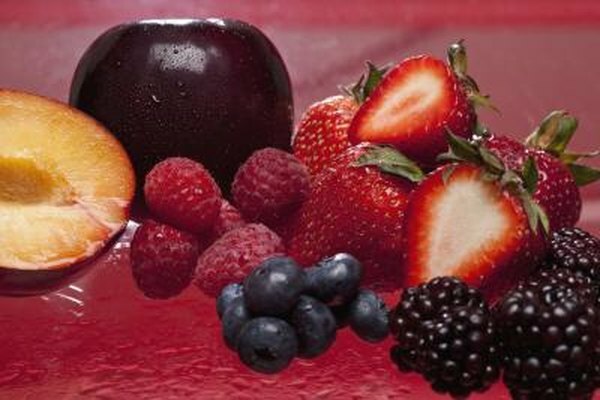 Women need about 1.5 cups of fruit per day while men need only 2 cups per day, according to MyPyramid.gov. Adults who spend more than 30 minutes per day exercising at moderate intensity may have room in their diets for higher fruit intake. One small apple, one large banana, one medium pear, three medium plums, eight large strawberries, 32 seedless grapes or 1 cup of 100 percent fruit juice counts as one cup of fruit. Avoiding high-calorie fruits can help you control or reduce your daily caloric intake. High-calorie fruits often contain more carbohydrates and sugar than other fruits. One large apple, for example, has 130 calories and 34 gram of carbohydrates, 25 grams of which come from sugars. One medium banana has 110 calories and 30 grams of carbohydrates, 19 grams of which come from sugars. One medium pear has 100 calories, including 26 grams of carbohydrates and 16 grams of sugar. To maximize the nutritional benefit of fruit intake while keeping calorie and sugar intake low, choose nutrient-packed fruits such as strawberries, cantaloupe and grapefruit. A serving of eight medium strawberries has only 50 calories and 11 grams of carbohydrates and provides approximately 160 percent of your daily vitamin C needs. A serving of half a medium grapefruit has 60 calories and 15 grams of carbohydrates and provides 35 percent of your daily vitamin A needs and 100 percent of your daily vitamin C needs. A serving of a quarter medium cantaloupe has only 50 calories and 12 grams of carbohydrates and provides around 120 percent of your daily vitamin A needs and 80 percent of your daily vitamin C needs. MyPyramid.gov: How Much Fruit is Needed Daily? MyPyramid.gov: Why is it Important to Eat Fruit?